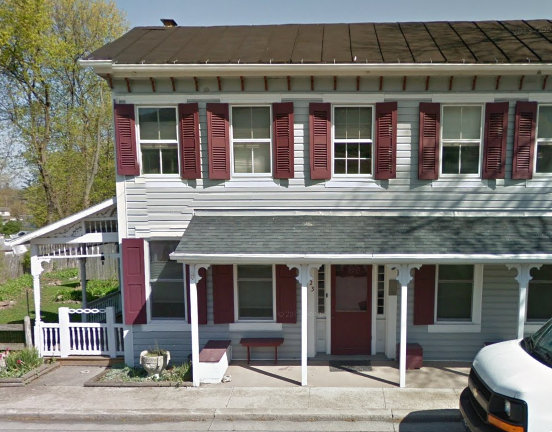 The home of Walter and Shelvia Hummel on East Main Street was built by James Logue, Boalsburg’s first coachmaker, whose factory stood right across Pitt (Main) Street. “Jimmy” enjoyed taking any customer in the factory at midday across the street with him for the noon-time meal. Mrs. Logue, a gracious lady, always welcomed them. It is said she had a full ginger-cake jar on hand all the time for children who came to the house. Of wood frame construction, the house at one time consisted only of the eastern half of the present home. Eventually a large 12-room ell was added to the west when J. M. Wieland owned it and his nine children and his mother-in-law lived with the family. Mr. Wieland owned and operated the coach factory at this time. The early part of the house still has the hair plaster on the second floor walls. The Hummels found and restored the shutters on the front windows, but discovered, too late, that the other shutters had been stored in a barn destroyed by fire. Mrs. Hummel said paring the shutters with their windows was easy because a careful former owner had carved matching numerals on them. Another feature of the house is its 38 box framed windows. On the side porch a Dutchman’s Pipe vine grew for many, many years. Among others known to have owned this lovely old home are William “Billie” Durst, who married Jimmy Logue’s widow;, the Henry Reitz family; their daughter, Alice Reitz Shuey; and Gerald Rishel.